Walking though a woodland is easy – until we leave the path and try to make our own way. 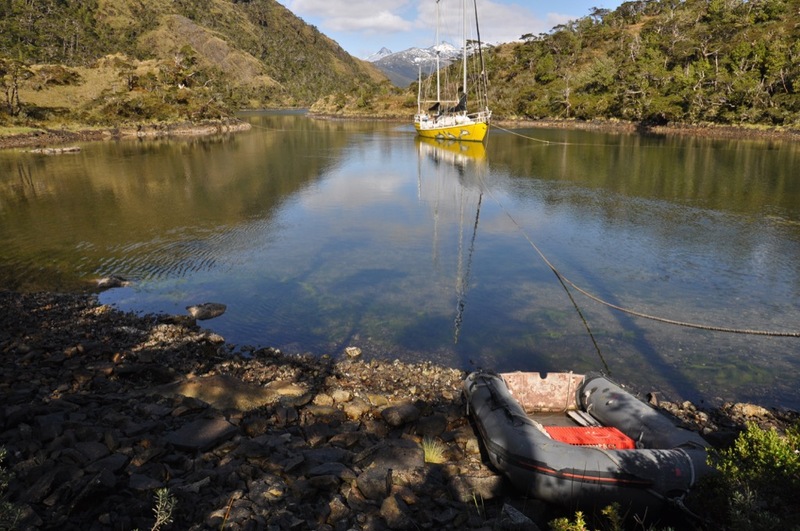 Having grown up in a land which is criss-crossed with ancient footpaths and other ‘rights of way’, I somehow take it for granted that the rest of the world must surely have been likewise tamed for my benefit; and so deeply ingrained is this expectation that when we moor the boat in some remote caleta in Tierra del Fuego and row ashore, I anticipate being met on the beach by a signpost – or, at the very least, by a clear and obvious trail. It’s ironic, really; I want this place all to myself – I truly appreciate the privilege of being able to wander at will in a landscape which is largely unexplored – and yet I want somebody else to have done the work of hacking a path through the woodland! Nice place! Okay, so where’s the footpath? “A path to where?” you might ask. Or a path to the pond where, we’ve been told, there will be beavers. Getting to that first beaver pond was no fun at all. The trees, which had previously seemed to stand tidily and respectfully on either side of my route, seemed, now that I was pathless, to be maliciously inclined. The big trees had simply to be bypassed, but the littler ones drooped their arms all over the place and grabbed at my clothing, and the saplings joined hands to form an impenetrable barrier. 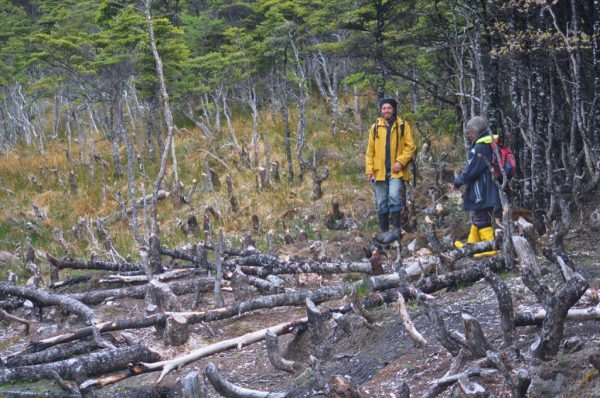 We spent an hour or more meandering in approximately the appropriate direction – dodging around thickets; scrambling up and down mossy slopes – and then, suddenly, the forest spat us out. This pond and the surrounding bog were crafted by beavers. We now stood on the edge of a springy wet mattress which extended for a hundred yards. A bog, indeed. Squelching our way across the bog, we eventually reached a pond. A melancholy affair, it was – and that, not so much on account of the louring grey sky and the sleet which now fell upon us, but because it was a graveyard. Pretty much the entire pond was peopled by gaunt skeletons – the last remnants of trees which must once have been as vigorous as those bastards now in our wake, but which this pond had drowned. Around the pond we went – now, finally, following a muddy trail. And who could have made this trail but the very beings we had come to see? We were obviously in the right place, and excitement was mounting. Soon we came to our first ‘carpentry shop’, as I now call these places: Our first introduction to the techniques and abilities of the American Beaver, Castor canadensis. Several trees of surprisingly large girth had been deliberately chopped down and their bark removed. Fresh yellow flakes of wood lay in piles on the ground. A cleanly felled tree. Note that others in the vicinity have also been chopped and chewed. 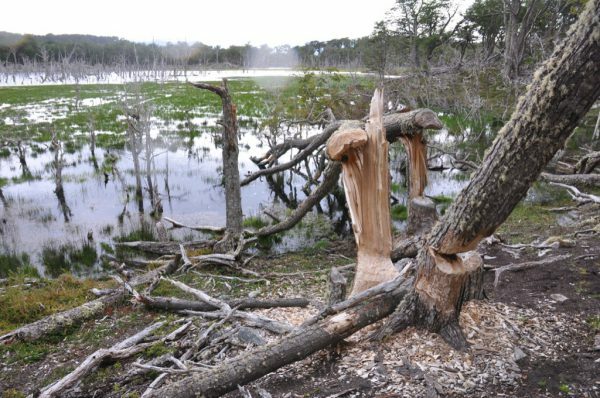 This time the beavers seem to have bitten off more than they could chew and to have given up half way through the job. A cleanly felled tree. 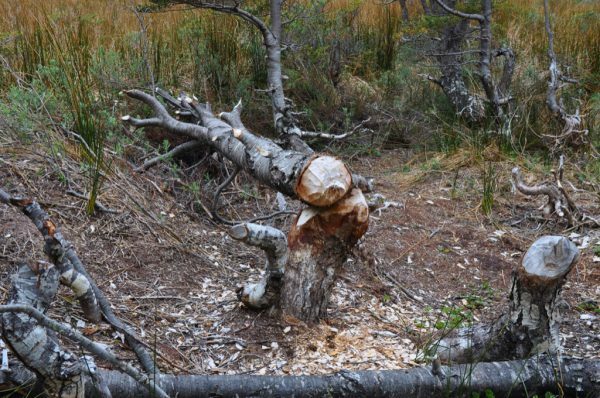 The beavers have chewed off the branches and taken them away to their lodge. 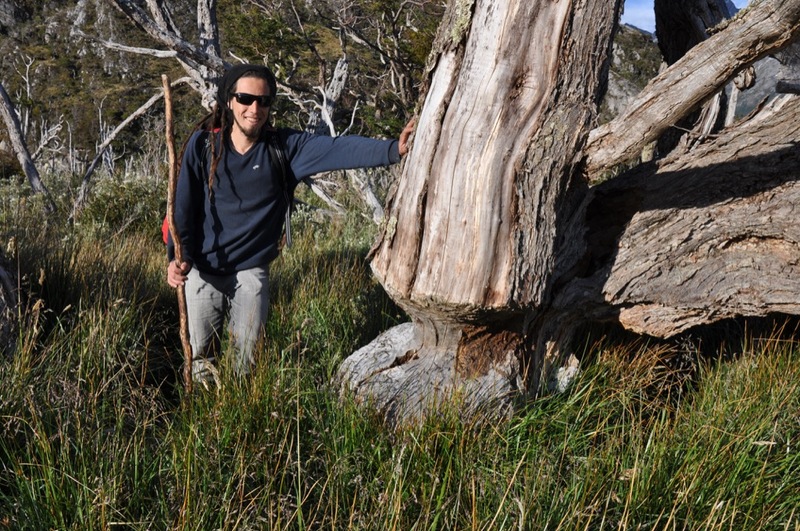 They will probably climb onto the trunk and eat the rest of the bark in situ. Eventually we reached the far side of the pond and here we found our first dam and, close to the dam, our first lodge (as the beavers’ house is called). Both were quite shockingly impressive. 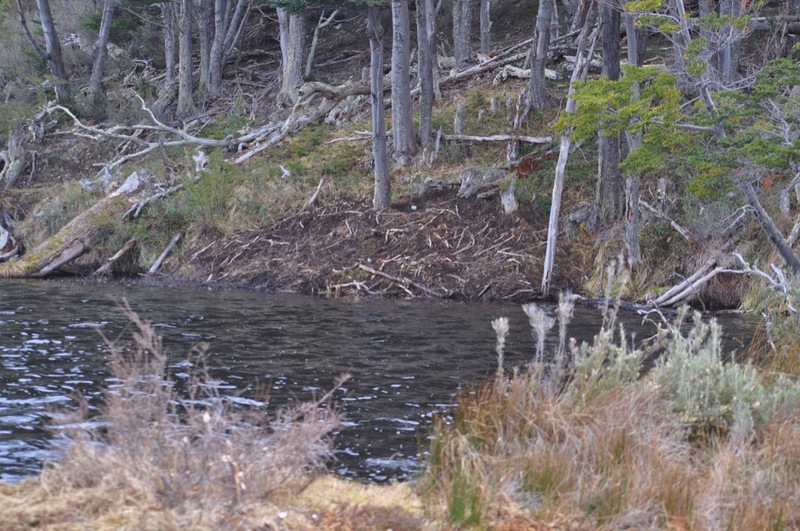 I think that, until now, I had assumed that beavers were capable of making low, untidy wooden barriers which probably leaked as much water as they held back – but this dam was about 150ft wide and at least 8ft high; and it hardly leaked at all! This well-made dam holds back several acres of water. Within the pond are numerous trees which died when the area was flooded by the furry engineers. Caesar crossing a dam. Slip one way and you fall eight or ten feet; slip the other, and you find yourself in icy cold water. Most small beaver ponds are fed by a stream and the surplus water flows over the top of the dam, but some are filled only with rainwater and the beavers must then work to keep their dams totally watertight. “And just think of the number of trees that they’ve killed,” said Roxanne, more soberly. As for the lodge – how does one begin to build such a thing under the water? We sat on the bank, close to the dam and close to the lodge, and drank our mate and tea. I looked at the lodge and wondered who was within. The only door is under the water, but the living quarters are above sea-level so that the family can dry off and keep warm. We’d read that beavers only come out at night, but I had a suspicion that such behaviour only applies to beavers who live in those parts of the world where man is also to be found. After all, why would a creature which eats trees want to do it only in the dark? Sure enough, we’d been sitting there for only five minutes when we all heard a sudden loud splash. A minute or two later, a small brown head was seen gliding swiftly across the pond, and a beady brown eye observed us keenly. “Splat” went creature’s tail on the water as, once again, he warned his wife and kids to stay out of harm’s way. A second later, he reached the vicinity of his home, dived – and was never seen again. 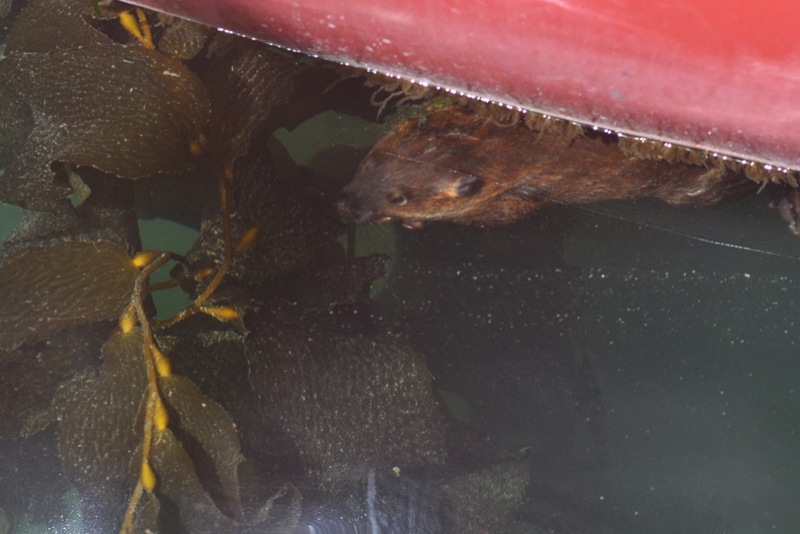 I pictured the beaver ascending into the outer chamber, clambering nimbly out of the water and shaking himself. “What is it, Darling?” his wife asks nervously, as she peers down from the cosy den. “What is it, Daddy? What is it?” ask the little ones, picking up on the tension in the air. Well, I guess they must think something of that sort, otherwise why would they be afraid of us? One glimpse of a beaver was all that it took for me to become fascinated by this creature. Then again, was it the glimpse of the animal himself which so attracted me, or was it acquaintance with his handiwork? Ever since this first encounter, wherever we go in this region I am on the look out for signs of the beaver’s presence; and I am seldom disappointed, partly because beavers are abundant but mostly because the signs are anything but subtle. What other creature makes such a mark on the landscape, apart from man? 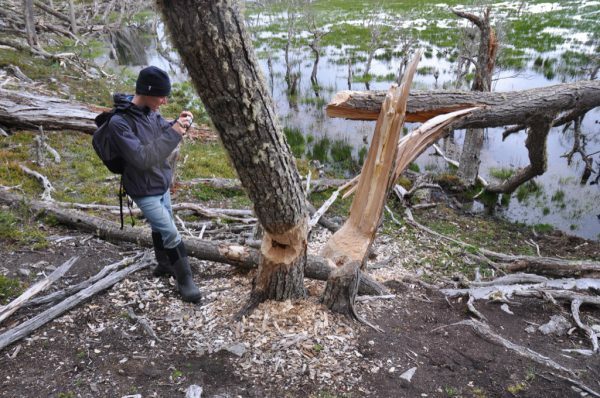 Who else but man and the beaver can leave his mark in such a dramatic fashion? In point of fact, the American beaver has now been identified as the number one cause of environmental change in Tierra del Fuego – and that’s without disregarding our role. In this part of the world, and in no other, it seems, our destructive tendency has been surpassed – by Castor and Co.
Beavering away in the woodland, Castor and his kin cut down whole trees in order to win a week’s fodder. Intent upon creating ponds suitable for their abode, they flood hollows and kill scores of other trees. But beavers are part of Nature – right? So it must be okay. Man slashes and burns whole forests. He is destroying entire ecosystems and forcing thousands of other creatures towards extinction simply in order to grow palm oil and loo rolls or to raise cattle. Beavers, on the other hand, are just doing what comes naturally. However, when you look more closely at this situation you realise that man is not so very different from the beaver. Like the beaver, the eaters of those cows for whom Amazonia is being destroyed are just satisfying their hunger; and likewise the consumers of those cookies and spreads containing palm oil from Indonesia. Everybody has to eat! It might be said that the cow-eaters and the cookie-munchers are satisfying their hunger in inappropriate ways… but, as it happens, the same goes for the beavers in Tierra del Fuego. The problem is that these beavers are not natural. They shouldn’t actually be here. 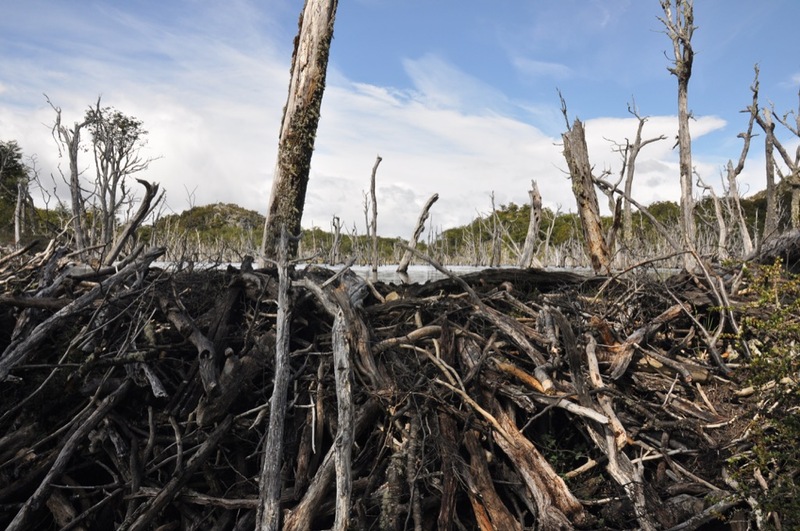 The problem began in 1946 when some genius proposed introducing beavers from Canada into a lake in Argentina. The idea was that the animals would breed and flourish, encouraging a thriving fur industry. What sort of person wants to murder someone else to steal his coat, anyway? Modern fur industries generally involve captive furry animals, but the instigator of this plan evidently envisaged an old-style enterprise with trappers paddling around in canoes. 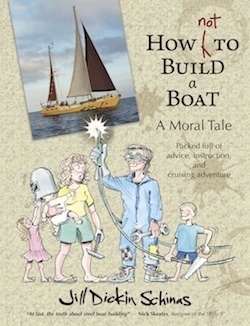 Stage two of the plan failed abysmally – partly, one assumes, because the notion was so out of date – but stage one was an unprecedented success; and it is in the success of the first part coupled with the failure of the second part that the problem resides. Just 25 pairs of beavers were released into that Argentinian pond, but their descendants have now spread right across Tierra del Fuego and they are reckoned to number somewhere in the region of 200,000. 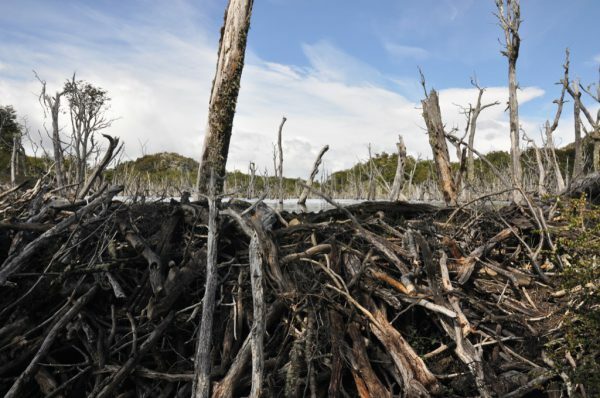 Whereas in the north of the continent beavers face predation from wolves, bears, and pumas, here they have no enemy, and so there is nothing to keep their numbers in check. 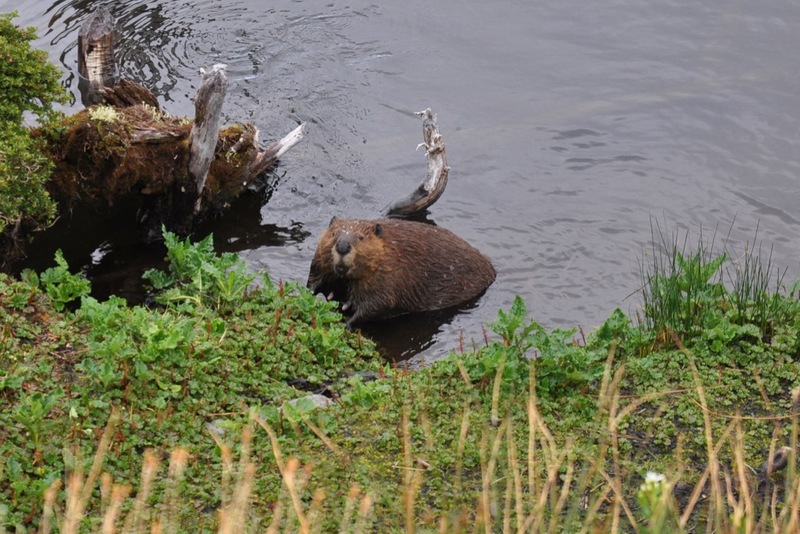 Beavers in North America and in Europe have their fans and also their detractors. On the debit side, their activities cause extensive flooding which can threaten mankind’s own schemes. On the other hand, they are known to increase biodiversity in the areas where they live. The newly-created ponds encourage a rapid expansion in the number of freshwater fish, and they also provide much-needed habitat both for waterfowl and for insect-eating birds (many insects having a larval stage dependent on the availability of freshwater). In the south of the continent, it’s a different story. 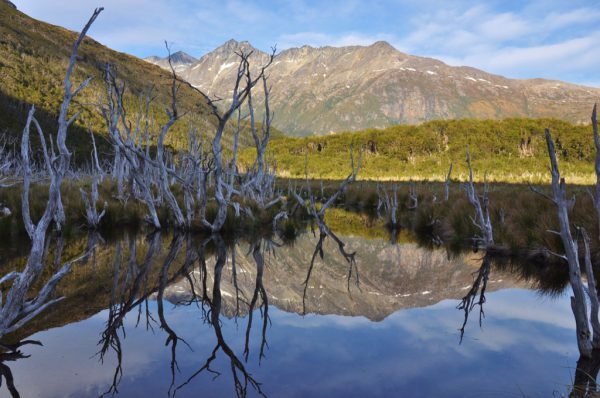 Whereas the ecology of Canada and North America evolved with the beaver occupying the role of a ‘keystone species’, in Tierra del Fuego this animal is merely a pest. 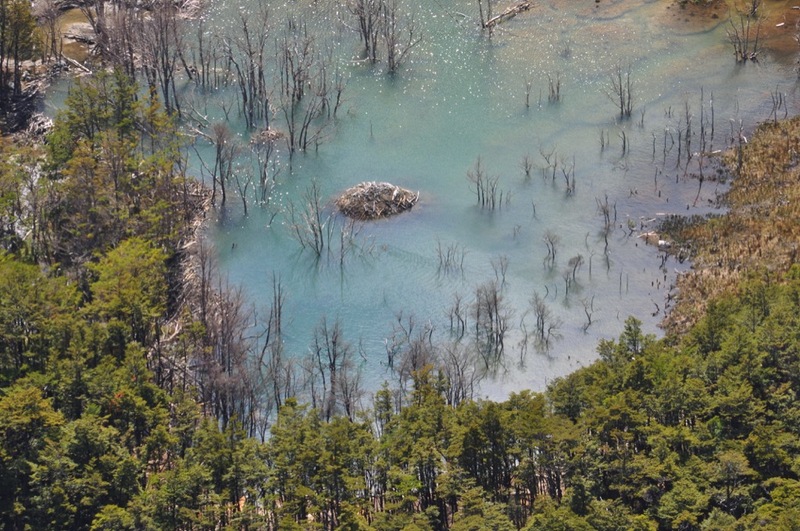 In Tierra del Fuego the ponds which the creatures create are not home to any fish or to an abundance of birdlife. On the contrary; they are silent and gloomy places. 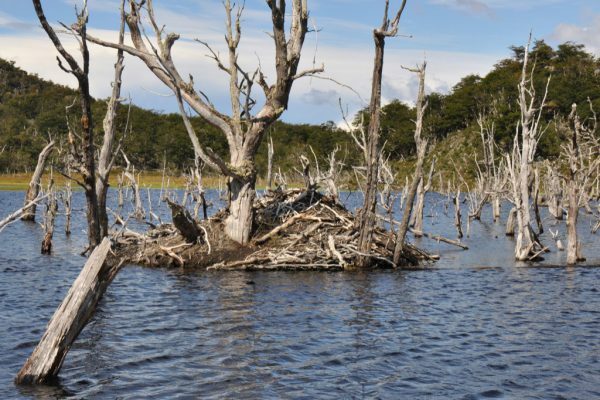 Moreover, whereas in the north of the continent the local flora seems to benefit from being coppiced by the beavers, the trees endemic to the southern region don’t survive the onslaught from those incredible inscisors. Where the beavers have been at work, the unique virgin forest of Tierra del Fuego has vanished and there is now only a swampland riddled with little leats. That is the big question, and so far as the environmentalists are concerned the answer is obvious: the beaver must be exterminated. As a matter of fact, the government of Chile has spent several years trying to exterminate the beaver. You would think that this might be quite an easy thing. 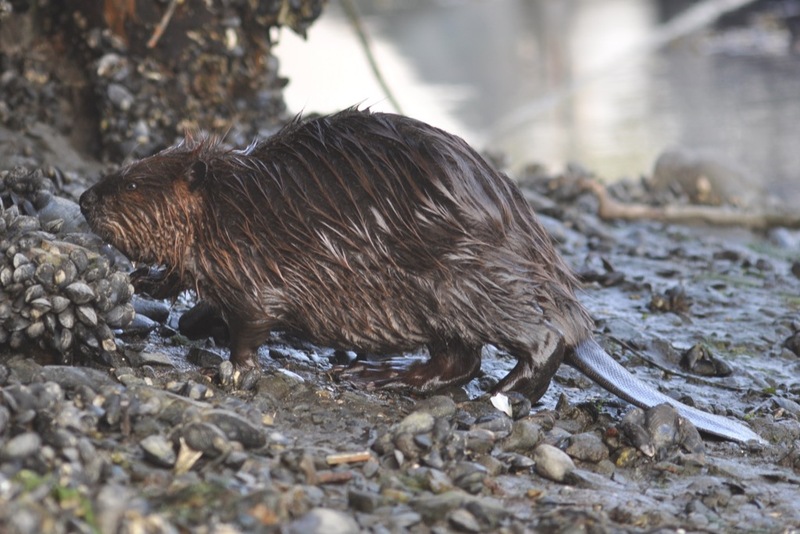 After all, the European beaver was accidentally driven to the verge of extinction by trappers, and it was entirely wiped out in the British Isles. 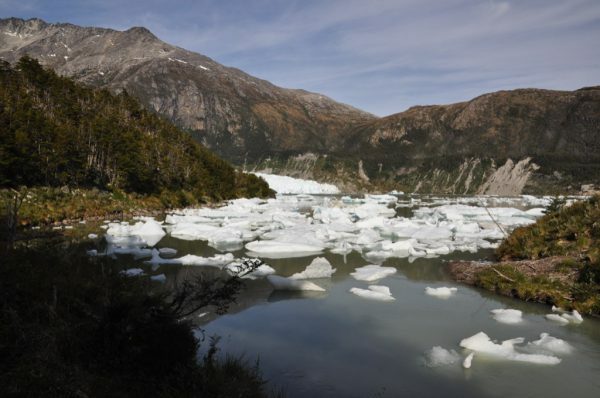 However, the terrain in this part of the world is rather different and rather less hospitable towards man. The programme to get rid of the beaver was described by Nature magazine as “the largest eradication project ever attempted”. Helicopters, boats, and dogs, as well as men armed with rifles and with vicious gin traps were all employed – but in the end the undertaking failed. Beavers were totally eradicated from the more accessible areas, such as Isla Navarino – but not for long. 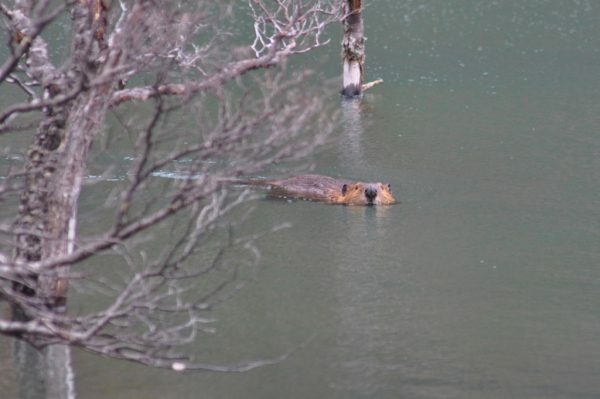 Beavers can swim. And beavers can disappear into the landscape. You can destroy every dam and every lodge, but the survivors, hiding in the woods, will live on. 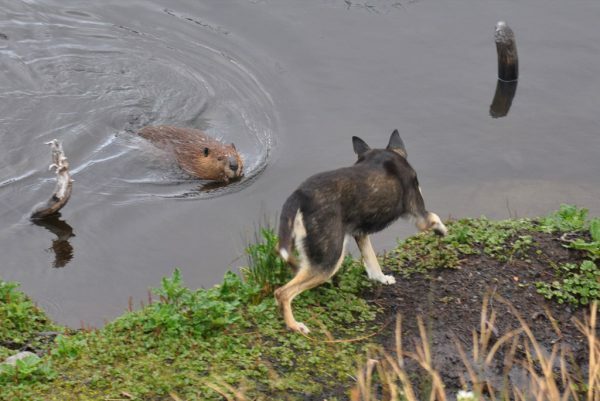 Some dogs will jump into the water and kill a beaver, but Poppy was simply mystified about this one. I realise that my sentiments are out of line with environmental concerns, but I have to say this anyway: I love beavers, and I’m in favour of leaving them in peace. I’m not in favour of cold-blooded killing. I’m not in favour of man trying to control Nature as if it were his own back garden, forever aiming to keep the status quo. 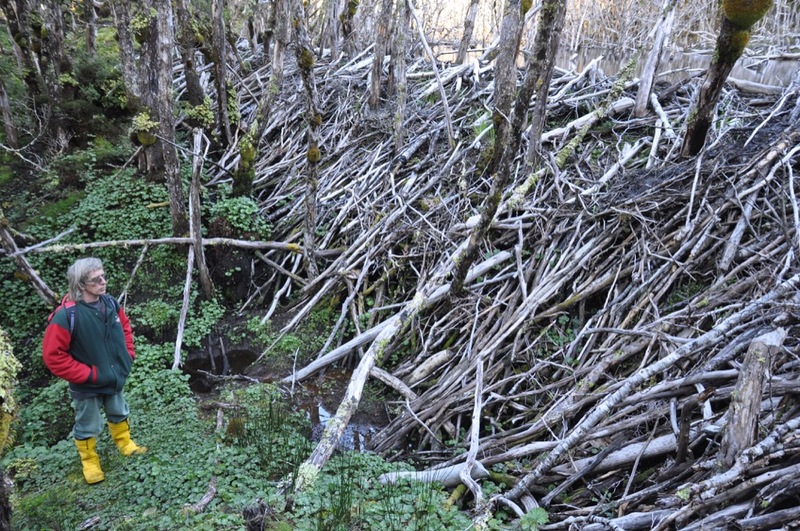 I admire the beavers and I think that they add tremendously to an otherwise rather vacant landscape. However… although there’s room for 200,000 beavers, there certainly isn’t the space for twice that many. Come to that, there isn’t really the space on the planet for twice as many meat and cookie eaters as we now have, is there? 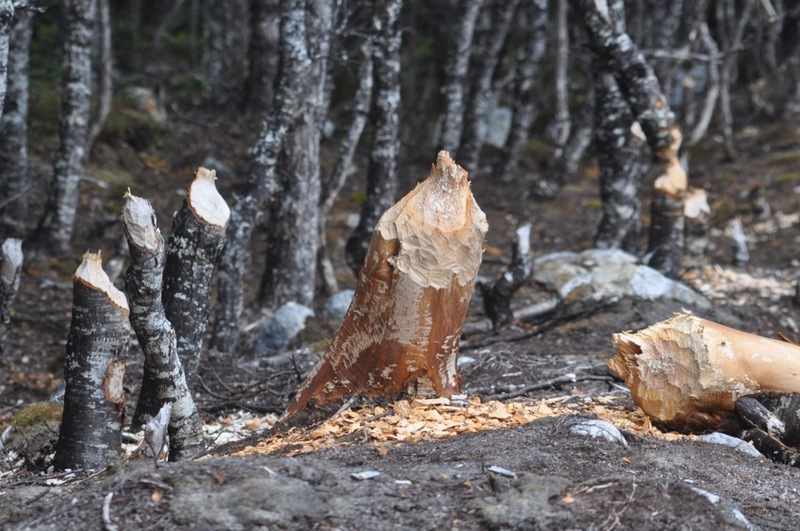 And although the beaver is currently making the bigger impact on Tierra del Fuego, we’re hardly in a position to criticise. Man has buggered things up in Tierra del Fuego. 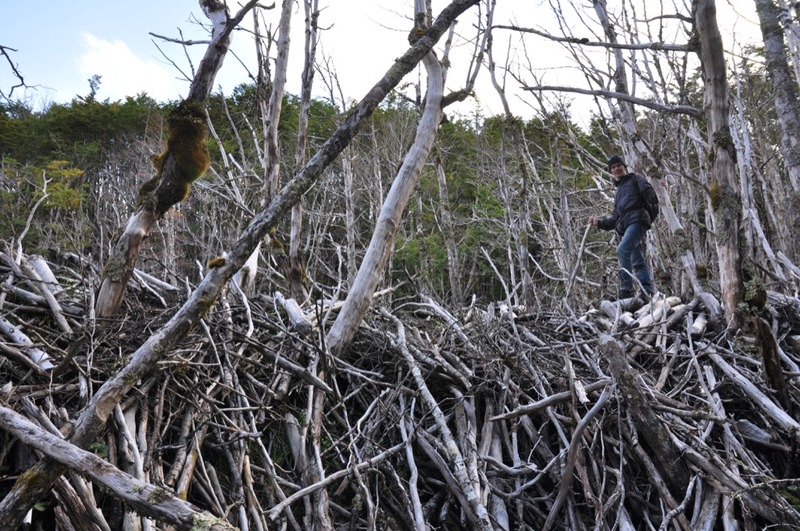 He should never have tossed these beavers onto the landscape. There’s a huge lesson here – but, of course, we’re learning it too late. We’re living in the anthropocene, in an era where Nature has become homogenised, and plants and animals which rightfully belong in one ecological setting have been spread over the entire planet. The beavers are just the most visible sign of man’s interference in Tierra del Fuego. Two years ago, we hear, there were no yellow-jacket wasps here, but now they’re abundant in Puerto Williams. 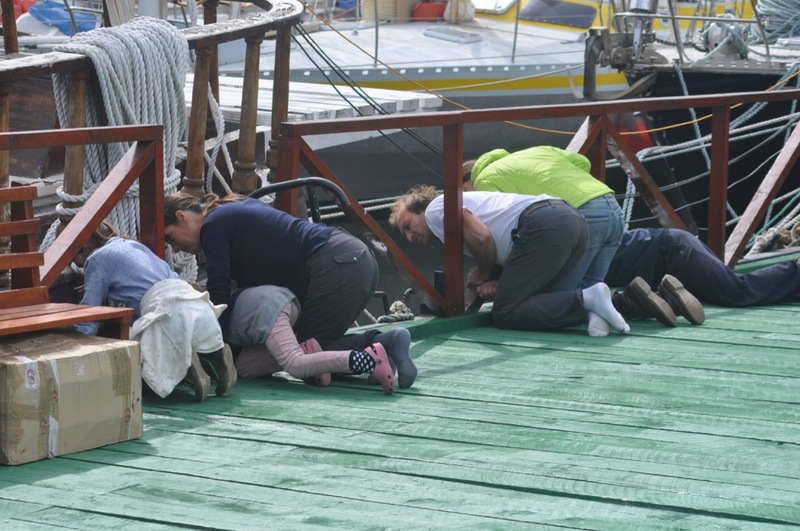 It seems unlikely that anyone deliberately introduced them but they arrived anyway, probably aboard the ferry. Having arrived – and having no predators – they will prey on the local insect population, to what effect, one cannot even begin to guess. 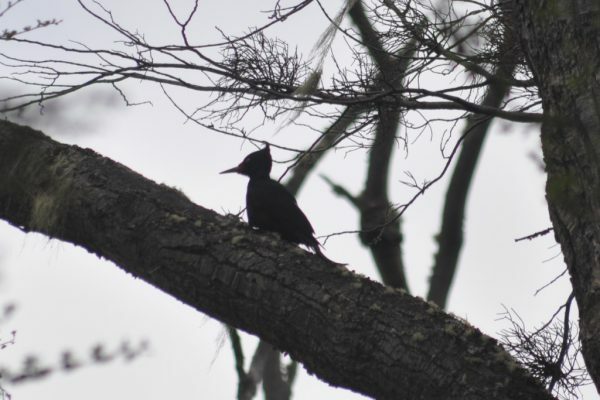 Will the yellow-jacket wasps prey on the Magellanic woodpecker’s fodder? 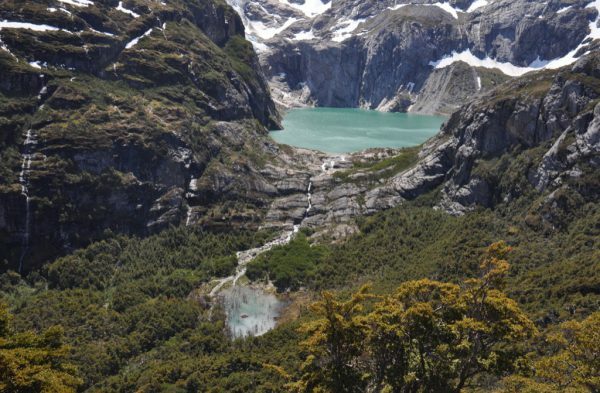 The wasps are currently just a potential threat, but other invasive beings are already having an effect on life in Tierra del Fuego. 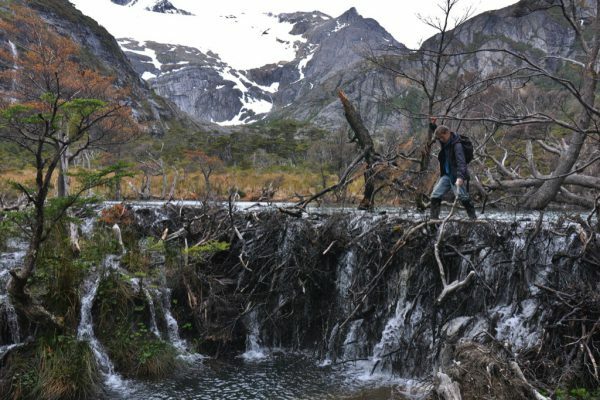 Besides introducing beavers, the Argentinian economists also dropped mink into the mixture down here. Mink are gorgeous – but only when viewed from a sentimental standpoint. So far as other animals are concerned, mink are murderous. 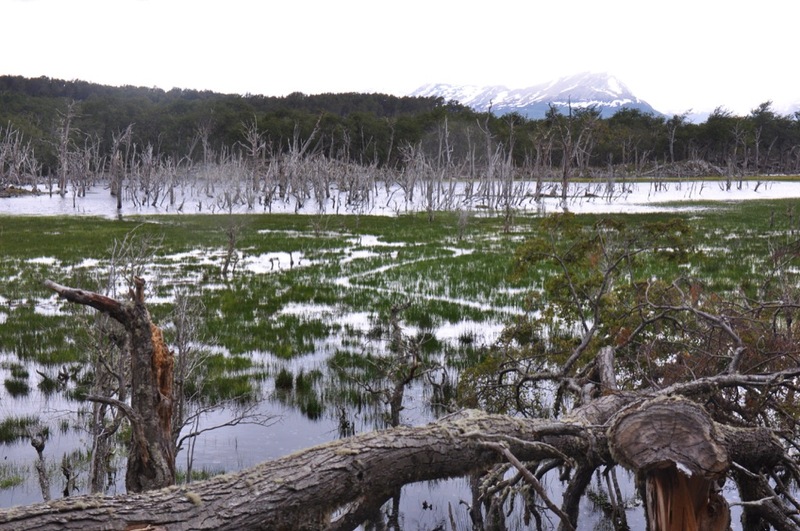 In Tierra del Fuego they eat fish, crustaceans, and all species of bird including cormorants and seagulls. 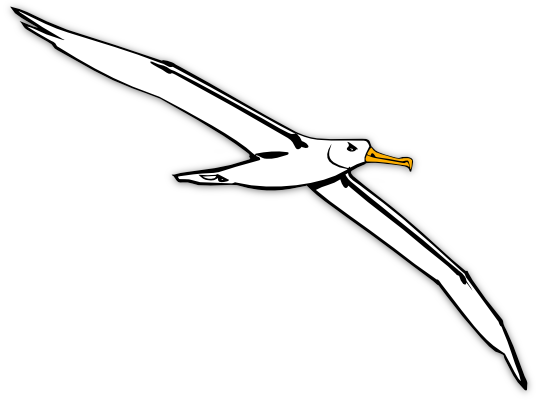 They prey on the young birds in the kelp gull colony close to Puerto Williams – and here they are subject to trapping by government officials. But they are also abundant everywhere in the Chileans channels – and away from the town they have no predator. In one place where we anchored recently we saw a dozen mink in the space of an hour – and all without even leaving the boat! 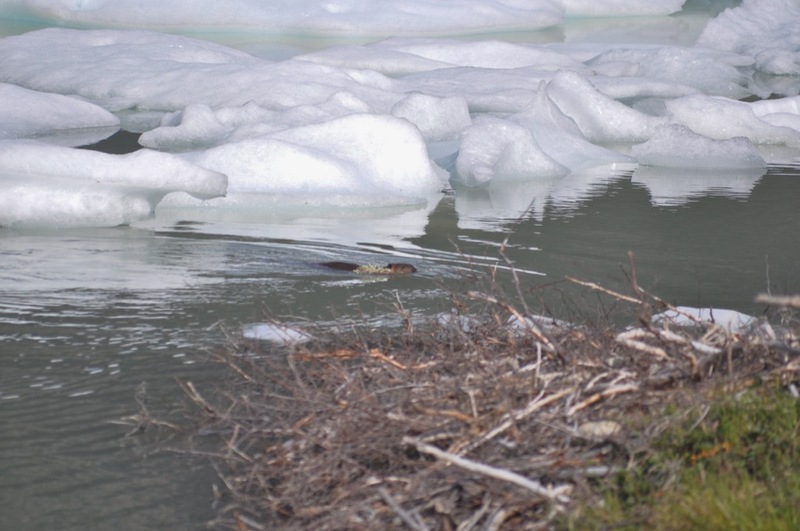 I admire the mink for his lithe body and his skill as a fisherman, but I loathe what he does to the other wildlife. Even so, I can’t condone his murder any more than I would approve the removal of any other carnivore. Meanwhile, I can’t arouse even the slightest bit of antipathy towards the peaceable and ever-so-clever beaver, because it seems to me that he is just a victim of man’s meddling. 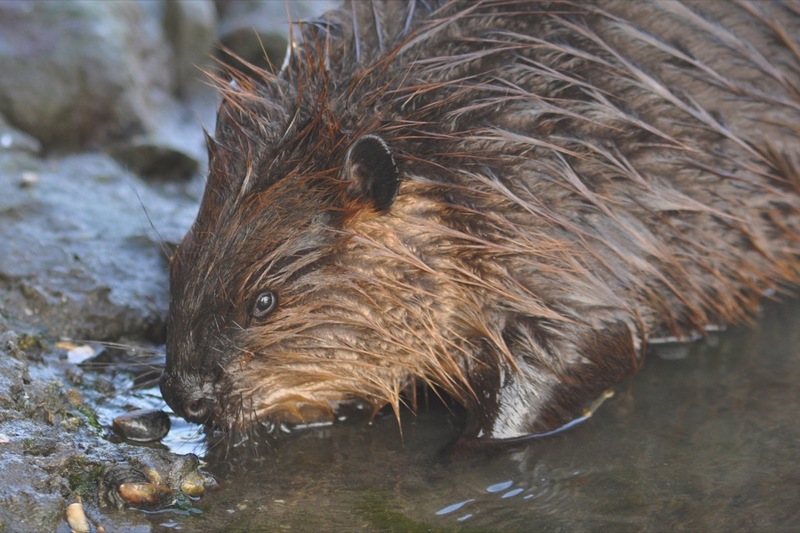 As I see it, the only fair solution to the problem of these invasive species is one which was apparently proposed even before the beavers were let loose: Even in that pre-conservation era, somebody was sufficiently far-sighted to see the consequence of interfering in this region, and he suggested that anyone considering importing beavers should also import grizzly bears. Now that would certainly make a walk through the trackless woodland more interesting. 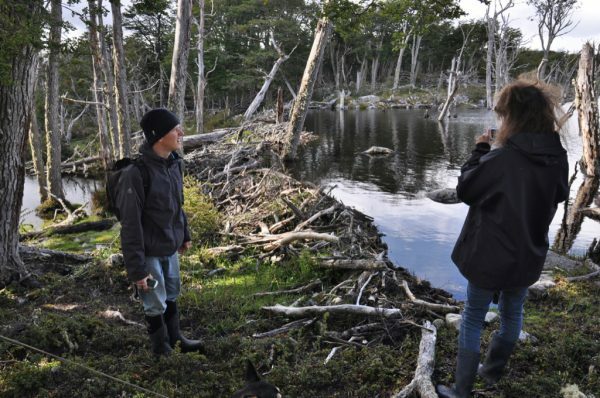 You might also like to read Roxanne’s much more scientific take on the situation in Tierra del Fuego regarding the beavers.